You are here: Home » Columnists » Transubstantiation—Hard to Believe? 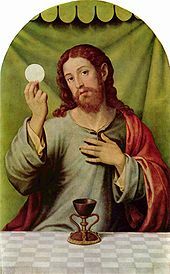 The Catholic Church teaches that in the Eucharist, the wafer and the wine really become the body and blood of Jesus Christ. Have you ever met anyone who finds this a bit hard to take? Not till the Middle Ages did theologians really try to explain how Christ’s body and blood became present in the Eucharist. After a few theologians got it wrong, St. Thomas Aquinas came along and offered an explanation that became classic. In all change that we normally observe, he teaches, appearances change, but deep down, the essence of a thing stays the same. Example: if, in a fit of mid-life crisis, I traded my mini-van for a Ferrari, abandoned my wife and kids to be a tanned beach bum, bleached and spiked my hair, buffed up at the gym, and made a trip to the plastic surgeon, I’d look a lot different. But for all my trouble, deep down I’d still substantially be the same confused, middle-aged dude as when I started. What makes this happen? The Spirit and the Word. After praying for the Holy Spirit to come (epiklesis), the priest, who stands in the place of Christ, repeats the words of the God-man: “This is my Body, This is my Blood.” Sounds like Genesis 1 to me: the mighty wind (read “Spirit”) whips over the surface of the water and God’s Word resounds. “Let there be light” and there was light. It is no harder to believe in the Eucharist than to believe in Creation. Our evangelical brethren speak often of an intimate, personal relationship with Jesus. But I ask you, how much more personal and intimate than the Eucharist can you get? We receive the Lord’s body into our physical body that we may become him whom we receive!